Is 2013 finally the year of the big boppers getting Rookie of the Year love? 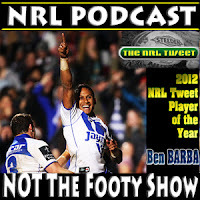 Traditionally the winner of the NRL Rookie of the Year Award has been a flashy outside back or a playmaker who shrugs off inexperience and holds his nerve the longest over the course of a season. But as you'll find in the next few paragraphs here on www.wdnicolson.com, the Rookie crop of 2013 looks like the domain of the giants. Plus we predict below which 2013 rookie is the best long term prospect. Traditional NRL Criteria: No more than 3 games played in previous season, however debuting before 2012 also makes that player ineligible, as does any Super League experience or being over the age of 26. So far 23 players have made their first grade debut in 2013 (all profiles apply as they have performed at the end of Round 6), and according to our statistics compiled from RugbyLeagueProject.org - with another 6 still eligible after debuting in 2012. 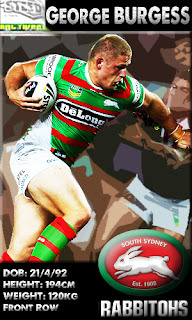 Burgess is your Rookie of the Year as it stands right now but he isn't a slam-dunk yet. He has transformed himself from a prospect who wasn't ready to play above NSW Cup into an impact player in the off-season - finding a way to harness his size and power and give Michael Maguire a weapon to inject into the game after 20 minutes. Harris just made his Test debut for New Zealand but he also got demoted to the Melbourne bench last weekend, so he's got some work ahead of him to hold onto his big minute role in the Storm setup. What impresses you about both of them is how seamlessly they've adapted to the respective game plans of their NRL teams. Neither looks out of place, and perhaps more significantly - both have brought something positive to the table. Fonua and Buchanan are on the next level - Fonua qualifying like Burgess because he didn't play more than 4 games in 2012, and Buchanan taking on a big role at the Tigers with Keith Galloway's injury. Fonua has been solid out wide for the Storm, he still looks a little out of place on the wing but he brings energy to the table every week. Buchanan is going to need a break at some point after making the step up from NYC prop to NRL starting prop, but he's done all that has been asked of him so far by Michael Potter (who lost Galloway to an arm injury in Round 2). The last two on the shortlist are Kelepi Tanginoa of the Eels and Daniel Tupou of the Roosters. Tanginoa impressed everyone at Parramatta during the pre-season and was given his first crack at the NRL in Round 2 against Canterbury. A nugget of a backrower with outstanding endurance - he's played 80 minutes the past two games starting at lock. Though his coach Ricky Stuart says he will rest him sooner rather than later, the kid offers Parramatta much needed freshness in their forward pack. Tupou is a towering figure on the wing for Easts and as he gains confidence in his body being up to the rigors of the NRL - he'll produce more of the hard work he displayed on ANZAC Day coming out of his own end. 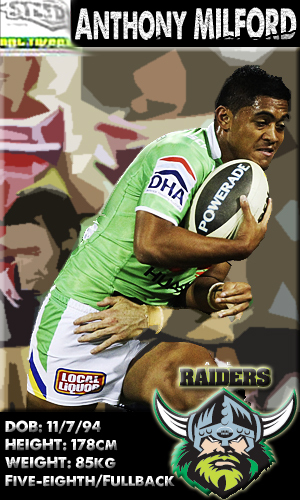 Michael Oldfield is a quality finisher but Tupou's form is keeping him in reserve grade. Burgess could be anything - and he's tough enough to get up from a Steve Matai cheap shot - so he's got genuine ticker as well. Harris and Tanginoa are great prospects, both showing excellent stamina as rookies. Compare how the best Rookies rate against the rest. The Rookie Skinny: Milford has been compared to Johnathan Thurston in how he 'stays alive' in the game but his first grade chances may be few and far between if Terry Campese stays fit. Drinkwater now has to make the most of any starts he gets over the course of 2013 if he wants to be 'the guy' in 2014 with Jamie Soward off to Penrith, but if Rangi Chase arrives - will Drinkwater get any more chances? 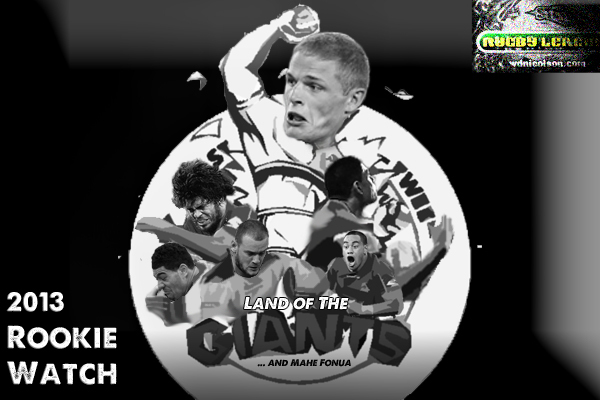 Klemmer is a man mountain only recently out of nappies, but hasn't looked out of place. His main obstacle isn't ability but the heavily stocked Canterbury front row. Tedesco played for City Origin but has a great deal of improvement to go, if he holds onto the fullback spot ahead of Tim Moltzen then he might enter serious discussion for Rookie of the Year - but not from the wing. Laumape has impressed his coach Matthew Elliott but he hasn't done much yet, and if everyone is fit in Auckland - he won't stay in first grade. Finally Sims has been given just two cracks and hasn't caught the eye of anyone yet, if Bennett calls on him again he should have some significant NSW Cup game time under his belt. Stockwell debuted last year (and as it was pointed out on Twitter - slipped through the cracks on our first draft) with 3 games for the Dragons, and although he's now played 4 games in 2013 - he's just not getting the minutes we need to see to gauge his real ability. The raw materials are there - he's a big unit, but let's see more of him please Steve Price. Moylan was very impressive in game one against the Eels... but let's see more please Ivan Cleary. Milford is the most exciting of the group with the sky the limit to his potential, while Klemmer's size makes him an intriguing long term prospect. Drinkwater will either be a star or a flash in the pan... like so many NYC halves that dominate that competition. The Rookie Skinny: We'll get a look at most of these guys again in 2013, but there are a couple to keep a close eye on. Kenny Bromwich may struggle for a decent role outside of the Origin period but he's got big wraps down south. Two young hookers - Sam Irwin and Slade Griffin - have something about them in terms of work-rate but are stuck behind either a hooking queue on the Gold Coast or a legend in Melbourne. Ineligible - But may be incorrectly considered Rookies in some circles. 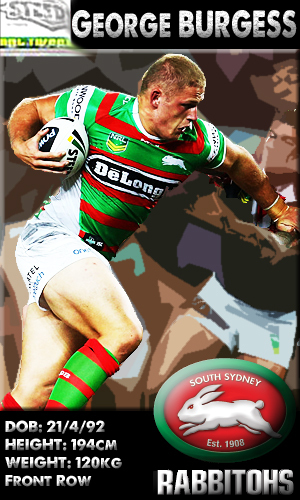 2013 Rookie Recap: Right now George Burgess is the standout pick for Rookie of the Year, closely followed by Tohu Harris. But if we had to choose just two to predict have the brightest future in the NRL - we'll pick Anthony Milford as the best superstar prospect if the Raiders handle his progress into the NRL the right way, with Burgess capable of being a star at international level as well as for the Bunnies. Harris looks like the second coming of Ryan Hoffman - only bigger. Who is your pick for Rookie of the Year so far? Any tips for a player to watch who hasn't debuted yet?